Manila, Philippines— President Rodrigo Duterte once again made a controversial remark against the Catholic faith. “ Talaga itong mga Katolikong p***. Bakit naman may All Souls’ Day tapos may All Saints’ Day? Hindi nga natin alam kung sino ‘yang mga santo na ‘yon. Sino ‘yung mga g*** na ‘yon? 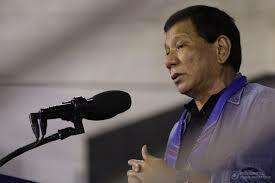 Mga lasenggo,” Duterte said during a briefing in Isabela province Thursday. He then said he would give the public one patron saint to recognize. “Get hold of a picture of mine. ‘Yan ang ilagay niyo sa altar (That’s what you put on the altar) Santo Rodrigo,” Duterte said. Last June 23, Duterte called God “stupid,” which prompted the Church to issue a strong statement against mocking the Catholic the faith.